This class finished up working with the Purchase Orders that we started in Access 328. We'll begin by designing a printable PO report that you can send to your vendors. We'll put a button on our PO Form to CLOSE the PO (mark that it was sent to the vendor). We'll make options on the PO Form to see POs that NEED to be sent to the vendor, and that HAVE been sent to the vendor (we're still waiting on parts). When the parts come in from the vendor, we'll have another button to mark them received. Next you'll learn how you can have Access automatically generate an Email to send the POs electronically. Finally, we'll go back to the Letter Writer that we built back in Access 204 and 205, and I'll show you how to use it to send Bulk Email. Microsoft Outlook Email Security "Feature"
Terry Hopper on 8/31/2009: I believe all I need to do to receive partial orders is to have a 'Yes/No' box next to the part being modified as 'Partial' or 'Not' correct? And write the code accordingly, correct? That should make the lesson simpler as opposed to doing an entire lesson on partial received items. Just a thought. I will try this. As you can see, everything between the "MISSING BEGIN" and "MISSING END" was just added by me. You need to create a Recordset loop to go through each item in the PODetails table and increase that product ID's quantity on hand. I can't believe it has taken a year and a half for someone to catch this problem. This course was released in October of 2008. Wow. Anyhow, thanks to Darl H. for catching this... and sorry it took me so long to post a solution. Almost on the last lesson so far I like to ask you (as you asked to do) to make an lesson on "partial order shipping and returns". For this is quite normal to happen. As well as (if you are on the subject now) multiple vendors for any article. So there could be several "open orders" to several vendors who could suply the article we need. This class for me was difficult. I checked all the code several times on several days but I cannot find where I am messing up. Even checked the tables used and their properties. (Also added the missing code). So it is very tempting to just copy your db, because yours works. It might be because I am still working with XP and you with 2003. I located the problem in the "BuildPOList" code. I can't get past an error message where Access asks for a variable on a yes/no field (it doesn't mention which). The event just doesn't work when changing the checkboxes. The labels don't work either. Still I am not able to find the difference between your code and mine. Ben Chua on 12/20/2011: As you mentioned, yeah partial order is interesting - but if you look at the table PurchaseOrderT, the default for PartsReceived is True - I think this is where you can adjust the quantity as partial if the return value is False. Anyway while you are still deciding - I will play with the codes. But I would really like to see is a RFID and BarCode Reader for Inventory. There are some merchandise comes in bulk as well. Most of them has a barcode already. For warehousing delivery and receipts - this will also include RENTAL and RENTAL Contracts. Well I've finished 329, I've inserted that missing code and all seems well, but after marking orders as received I'm still showing goods on order in ProductsT. I have been back through the lessons, but cannot find where I have gone wrong. Point me in the right direction please. in the course outline you stated "Outlook security feature", i've been creating some basic access application at my work and im interested if you discussed also in this tutorial regarding auto email via VBA (my problem is the security prompt "....a program is trying to access") did you cover how to bypass this in your lesson? Not really. This is by design. Microsoft doesn't want other programs sending spam via Outlook. You either have to deal with the prompt OR find an older version of Outlook that doesn't have it (I keep Outlook 2000 on one of my machines JUST for this purpose) OR use another email program. 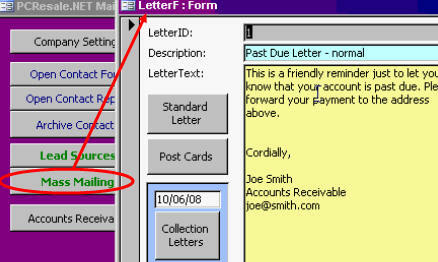 I have planned to create a seminar showing how to write your OWN email program using VBA. As soon as there are enough votes for it on the Waiting List, I'll put it together. I wish I had time to personally answer EVERY post. I do the best I can. I cover VBA programming for Access in my 301-329 lessons. My "Visual Basic" courses are for VB6 (soon to be upgraded to VB2010) and are a whole separate program. Yes, SQL Server is coming up too. Lots in the pipeline. Customers outside the US are no problem. Everything can be downloaded or viewed online. Thanks for you help as always. Perhaps an addendum to your code to increase on hand quantities after parts received...shouldn't we add a line of code to decrease the on order quantity in the inventory table by the same amount? I just added a line: "rs2!QtyOnOrder=rs2!QtyonOrder-rs1!Quantity..that seemed to work OK.
Are you able to do something for us reference using bulk email using some VB or VBA programming that gets rid of the Outlook Security Warnings! These warnings are annoying, and not condusive for running a small business. If you are able to help with something to bypass these warnings would be so very much appreciated. I'm going to do one better. I'm going to show you how to send email WITHOUT using Outlook. It's coming up in a new seminar very soon. This is absolutely wonderful news and I'm sure there are many members of your access community who can hardly wait for this seminar to come in as well. Yep. It's on the SHORT list. I'll be working on it soon. Robert Whishaw on 2/11/2016: I couldn't help but notice that the video doesn't cover the updating of "qtyonhand" units in ProductT, only how to update the purchase order from unreceived to received which is quite simple. What kind of VBA recordset code do we need to update the "qtyonhand"? I'd also really like to learn how to receive a partial order please. Was it not updated with this comment? 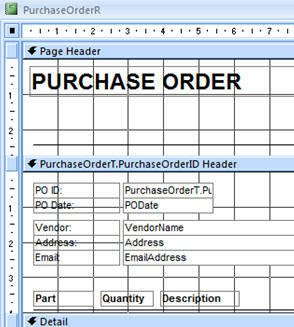 Me.RecordSource = "SELECT * FROM PurchaseOrderT WHERE PurchaseOrderID=-1"
"SELECT * FROM PurchaseOrderDetailsT WHERE PurchaseOrderID=-1"
Does the sample db work on your machine? There's a comment in the SI that explains the bug. It's always useful to read the other student comments. Shallena A on 3/10/2018: As I said in the original question... I did download the database and it gives me the same error when both check boxes are in the null position. And, I did read that post you mentioned... That code did not work either but I did figure out that I needed to add a line to the rs section to take the items out of quantity needed and that fixed that issue.